You think you want a pig? ​We will eventually have the ability to help many people, like yourself, with the costs of routine veterinarian care such as spays and neuters. Because we are a new organization, we will help as many as we can for now and once our organization is fully functional, we will update our ability and post what we will be able to assist with. For now, please email or message our Facebook page for more information. 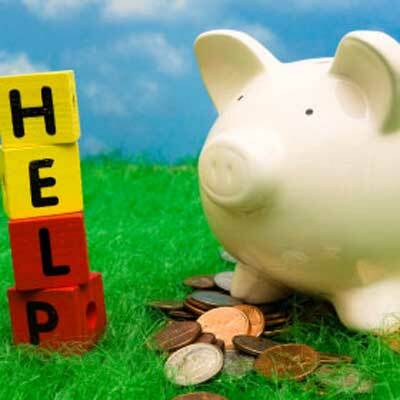 If you are having financial difficulties, you can try one of the organizations listed on this link. Mo Money for pigs is a 501c3 charity that helps piggy parents in need with emergency care and/or other finanicial needs. Click here to go to the Mo Money for pigs website. Shepherds Green has an outreach program that may be able to help. Best Friends Animal Society has a link broken down by state agencies that will assist you financially. Pig harnesses need to be a modified A design to truly be effective. Buying a dog harness will not provide you with the leverage you need without your pig being about to back out of the harness. 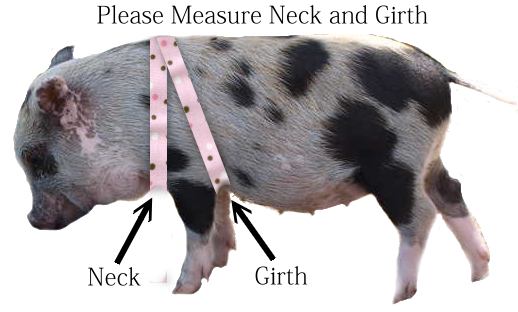 Its best to get a harness designed for a mini pig so you can ensure his or her safety. Did you see a super cute pig sweater? Maybe a great piggy hat? If so, those items likely came from one of these fantastic shops! Each name is linked to their website, just click on the name to be directed to the website for purchasing information or to learn more about their products. Great scratching pads you can place in areas for your pigs (and any other animal) scratching pleasure!! 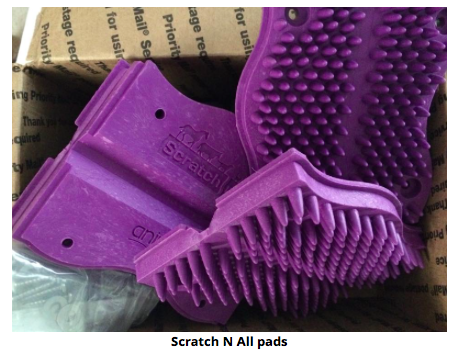 To visit their regular website, you can see what products they offer and also see other videos and reviews at scratchnall.com. Super durable, low sides for easy access. Very quick shipping. I ordered mine on Saturday and it was at my house Tuesday. Large size only available 40" × 54" blue or green. 139.95 Weight: 8 lbs (repair kits avaliable to match your color, glue included for an additional 19.95.) Great for litter boxes and rooting boxes as well. Rubber grooming glove- Your pig will love you forever if you have one of these. This helps to rid the body of that dry flaky skin as well. Zenport- I have had such a good experience with these hoof trimmers that I recommend them to everyone. Very reasonably priced. 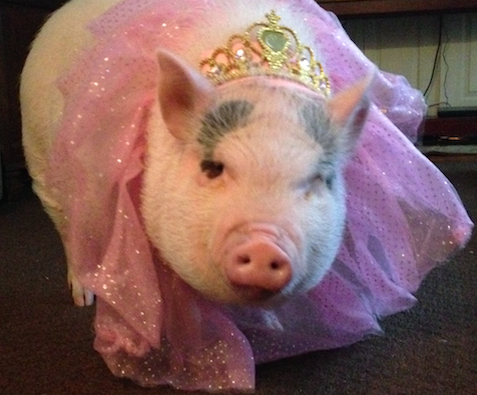 To help occupy your pig and to help clean their teeth Whimzee chews! These boards are used to protect you from an aggressive pig or to help guide an unwilling pig into a specific area that you need them to go into. There are homemade versions of these by using plywood and cutting out handles for your hands. These store bought boards are very well made and sturdy. These can also be found on Amazon.com, however, I didn't have a pleasant experience with my order, Hogslats.com fulfilled my order within 2 days with the correct size ordered versus Amazons wrong size, much higher price and it took FIVE weeks to receive. Check out these pig themed stores to find items for your home that will reflect the love you have for pigs. From artwork to tote bags, all of these shops have something any pig lover would "have" to have. MPI has greeting cards that you can purchase by clicking here!! Melinda Livie has a lot of pig shirts, stickers and other pig parent "must haves" in her Etsy store. Debby Porter makes a lot of pig themed jewelry and sells it in her Etsy store. If you say "I know Mo" when you're checking out, she donates a portion of the profits to Mo Money for pigs (which is a 501c3 charity that helps pigs in need). Pig wow can be found on Facebook and its creators make all sorts of fun pig themed related items as well. A portion of the profits are donated to a pig rescue also. Click here to view their Facebook page. Rhonda Kunnath has a store called Piggy wigglydesigns. Vetercyin Products- minor cuts/scrapes, eye care line, wound care, skin care, eye care and skin care.